The Printable Business Contracts are free below with immediate access. A business contract is a legally binding agreement between two parties for an exchange of services that are of value. For a contract to be valid, an offer must be made and accepted. Always contact your lawyer for legal advise on any contract. A Promissory Note is an acknowledge of debt with a written and unconditional promise to repay a loan or debt in a specified manner. It may also be called a loan agreement or personal loan agreement. 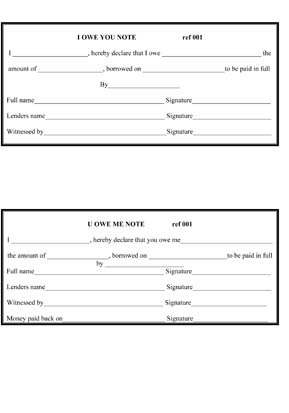 An I Owe You Note is a simple agreement to draw up contractually and is also known as a Promissory Note. 1. Get it in Writing – Oral agreements are legal and binding in some situations, but they are often difficult to enforce in court. In the small business world, most agreements should be in writing even if the law does not require it. The reason why the written agreement is less risky than the oral agreement is because you have a document that clearly states each party’s rights and obligations in the case of confusion and sometimes disagreement. 2. Agree on a way to Resolve Disputes – Always write into your agreement what you and the other party will do if something goes wrong. You can make the decision to handle the dispute through arbitration or mediation instead of going to court, which can take a lot of your time and money. 3. Agree on Conditions that Would Terminate the Contract – You should agree on certain circumstances that would terminate the contract. An example, if one party misses too many important deadlines, the other party should have the right to terminate the contract without being on the hook legally for breaching the agreement.